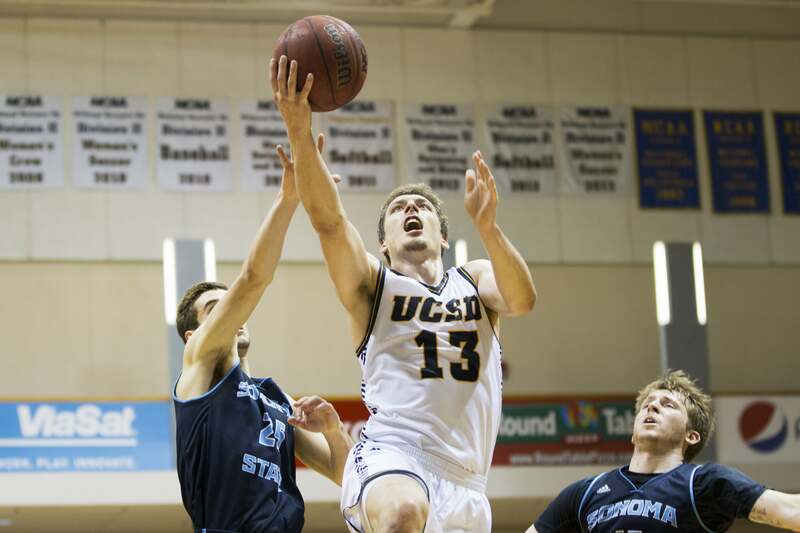 Despite having their magical season cut short in the NCAA West Regionals, the Tritons’ 24–8 overall record gave UCSD men’s basketball one of its best seasons in years. Following those statement victories, UCSD headed to Belmont for the Notre Dame de Namur Thanksgiving Classic, where it continued to prove it was a force to be reckoned with. In matches against Holy Names and Notre Dame de Namur, the Tritons won by 24 and 40 points respectively, flexing their offensive and defensive muscles. Afterward, the Tritons were ranked 22nd overall — their first NCAA ranking since 2001. Their win-streak would eventually come to an end, as they dropped a 67–63 game to third-ranked Western Oregon, but their show of dominance continued through the first half of the season as they kept piling on the Ws. By the halfway point, the Tritons were 11–2 overall and already closing in on their previous year’s win total. The Tritons only lost one more game in January, falling to Cal State Monterey Bay by 11 points, but that proved to be a fluke as the team simply started a new winning streak immediately afterward. On this streak, the Tritons earned one of their most important victories of the season in a slugfest with conference rival No. 13 Cal Poly Pomona. In a game where points were hard to come by, junior guard Adam Klie fought his way to 12 points and 10 rebounds, pushing the team toward a 41–35 victory and a series sweep against the Broncos. But in the final stretch of the regular season, something would prove to be rotten with the team’s performance. Despite peaking at an incredible No. 6 ranking in the NCAA, the Tritons simply couldn’t keep it together in their final games of the season. Beginning with a tough loss to No. 9 Chico State, UCSD dropped three out of its final five games of the season, causing its rank to plummet to 23 by the start of the CCAA tournament. Luckily for the Tritons, the team knows how to pull it together when it matters most. In an absolute thriller of a quarterfinal against Sonoma State, senior forward Drew Dyer summoned his inner Stephen Curry and drilled an incredible buzzer-beating three-pointer with 1.9 seconds left to send the game into overtime. Although trailing for much of the overtime period, the Tritons held the Seawolves scoreless in the final minutes of the game to pull ahead for a 71–66 victory. After downing Cal Poly Pomona for the third time this season to reach the CCAA Tournament finals, the Tritons looked as if they had returned to their midseason form. Unfortunately, the Tritons hit a rut. Facing off against Humboldt State in the tournament finals, UCSD laid an egg, as it lost 80–68 against a team it split the regular season series with. However, the Tritons were lucky enough to earn a berth to the NCAA Tournament, regardless of the outcome of the CCAA Tournament. The rematches continued as they defeated Chico State and California Baptist in the first two rounds of the NCAA West Regional. Looking to advance to the Elite Eight, the Tritons needed redemption against another familiar opponent — No. 3 Western Oregon. Although the game remained close to the very end, the Tritons’ inability to get consistent offensive production from their bench proved to be their downfall. Despite Dyer and Klie’s combined 36 points, the Tritons closed out their season on a 60–55 loss. “Coming to this tournament and winning games was a huge step for our program,” UCSD head coach Eric Olen said in the team’s final postgame press conference. Even with the heartbreaking ending, UCSD still had a remarkable season. The season marked the Tritons’ first win in the Division II playoffs, while the team’s total of 24 victories was a UCSD record. Drew Dyer and Adam Klie had phenomenal years, both being named to the All-CCAA First Team. Dyer, Klie and freshman center Chris Hansen all averaged double figures in points, with 15.4, 13.2 and 10.3 respectively. Klie led the team in rebounds with 5.8 a game, and Dyer averaged an incredible .451 from downtown. Drew Dyer and Zach McMillan are the only seniors departing this year, leaving next year’s team with a strong core.